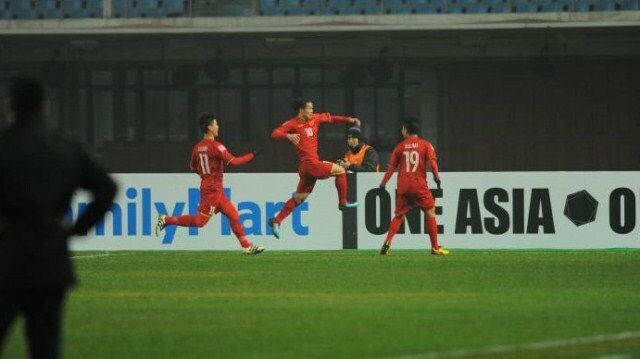 After a spectacular goal fest over 120 minutes with six goals shared between both teams, Vietnam U23 entertained their fans with a thrilling 5-3 win against Iraq U23 in a penalty shootout in their last eight clash at the Changshu Stadium late Saturday. A 3-3 draw after extra time sent both teams to a shootout and once again Vietnam proved their determination as they produced another miracle. 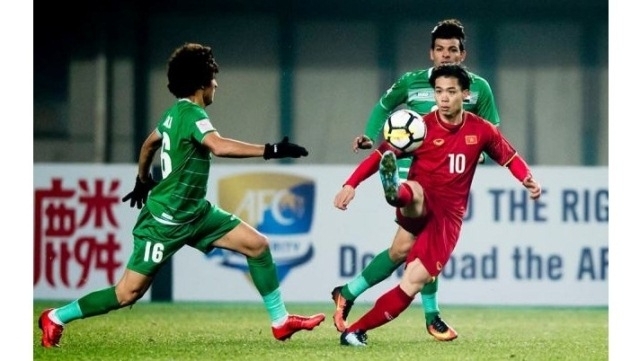 Vietnam booked a berth in the quarterfinals for the first time after surviving the “Group of Death” consisting of three strong teams from the Republic of Korea (ROK), Australia and Syria. Coach Park Hang-seo’s players clinched second place in Group D after three matches with four points. They dreamed of causing an upset against Iraq, who topped Group C. However, they did much more than that in the Saturday clash, resulting in a thrilling win and their best performance since the beginning of the tournament. Ahead of the knock-out game, Park announced that his team would play attacking football, which was a surprise as, in the group stage, Vietnam had played impressively with their resolute defensive and counterattacking tactics. The three previous matches had taken their toll on several Vietnamese players and impressive defender Van Hau missed the quarterfinal with an injury, forcing Park to field Van Duc and Xuan Manh from the beginning. Iraq with their physical advantage and fitness pumped the ball into the box, however, the Vietnamese players remained resolute and stuck to their game plan. They were successful with their 5-4-1 formation that did not allow their rivals to have much space to play. Both sides created several chances in the first few minutes but Vietnam were better and soon scored the opener in the 12th minute. Van Duc earned a corner kick for Vietnam and from the following corner the winger produced an overhead volley, which landed at striker Cong Phuong’s feet in a favourable position. The No. 10 player finished first time to give Vietnam the opener. However, the joy did not last long, as Vietnamese player Xuan Manh conceded a controversial penalty in the 28th minute after a foul with Aymen Hussein in the box. Hussein then leveled the score for Iraq with a right footed shot to the centre of the goal, despite keeper Tien Dung getting a hand to it. The Iraqis then increased the tempo in the last few minutes of the first half but Vietnam defended well to keep the score 1-1 after the first 45 minutes. The second half saw both sides go on the attack. Vietnam were almost on a par with their strong rivals in terms of ball possession. Cong Phuong had an effort in the 61st minute but the shot from a narrow angle was not enough to defeat the Iraqi defence. Previously, Van Duc could not beat goalkeeper Ahmed Basil. In the last few minutes of the second half, Park's players were under huge pressure from Iraq but goalkeeper Tien Dung and his teammates played well to force extra time. Iraq suddenly took a 2-1 lead four minutes into the first half of extra time thanks to Hussein’s header. The goal forced both teams to up the tempo with a range of dangerous attacks from both sides. Vietnam bravely fought back in the second half of extra time and their efforts paid off with the leveler by Van Duc in the 108th minute. Four minutes later, substitute Ha Duc Chinh lifted the roof off the Changshu Stadium with his goal to take Vietnam into a 3-2 lead. However, Iraq once again leveled the scoring thanks to Alaa Mhawi’s right footed shot into the top right corner in the 116th minute. The thrilling game finished 3-3 despite huge pressure from the Iraqi side in the last few minutes, forcing the two to enter the penalty shootout. In the first turn, Van Thanh successfully converted the penalty with a right footed shot to the bottom left corner. However, captain Bashar Resan missed from the spot as his finish was saved by Vietnamese keeper Tien Dung. Despite all of the following three Iraqi players finishing well, defender Tien Dung scored the decisive penalty to make it 5-3 for Vietnam. Wining the penalty shootout sends Vietnam U23 to the semi-finals for the first time. They will play Qatar in the second semi-final match next Tuesday. Uzbekistan and the ROK will meet in the first semi-final clash earlier the same day.